Alocasia Elephant Ears are named after their super-sized heart-shaped (or elephant ear-shaped) leaves. Excellent as a tropical plant around pools or patio areas. Equally hardy and resilient in full sun or partial shade area. they do like a fertile well drained soil and to be kept barely moist is summer. Cut the watering right back in winter. Elephant Ears bring high drama and bold texture to your garden . 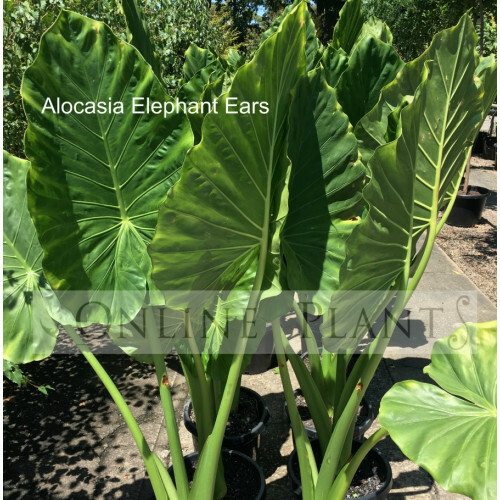 Growing elephant ears is simple — they like filtered sun or shade and rich, moist soil. Elephant ear plants, which are grown from tuberous rhizomes, can reach impressive sizes quickly.